Vintage Leaf Memories - Michael Langlois: Leafs versus New Jersey tonight: Could we play the Rockies or Scouts, instead? Leafs versus New Jersey tonight: Could we play the Rockies or Scouts, instead? Fans whose hockey roots date back to the ‘70s will know that the modern-day (and highly-successful, three-time Cup champion) New Jersey Devils are, in fact, the original Colorado Rockies. With the Leafs visiting the swamp this evening and not a lot that is terribly exciting going on in Leafland (we could talk more about who they don’t get to draft in June), let’s look back at some olden-days tidbits about the Devils/Rockies/Scouts franchise. • The first-ever General Manager of the Scouts was Detroit Red Wing Hall-of-Fame player (and long-time coach and GM) Sid Abel. Abel coached the Wings to 4 Cup finals in the 1960s, including 2 losses against the Leafs. • The first-ever coach of the Scouts was Bep Guidolin, who may have been the youngest individual ever to play in the NHL. He was only 16 when he played with the Bruins in the fall of 1942. • Denis Dupere, a good penalty-killer with the Leafs in the very early ‘70s, played later with the Rockies, as did former Leaf goalie Doug Favell. • A member of the “Broad Street Bullies” Stanley Cup champions (though he was never big or a bully) Simon Nolet, was an original “Scout”. • Future Maple Leaf Wilf Paiement (a rugged winger and a solid NHL player) was the first overall draft choice of the Scouts in the summer of 1974—the then expansion team’s first year in the league. • Paiement later came to the Leafs in the awful trade that sent Leaf fan favorite (and future Hall-of-Famer) Lanny McDonald to the Colorado Rockies. • Paul Gardner, son of former Leaf forward and radio analyst Cal Gardner, had some of his best years offensively with Colorado before joining the Leafs in the late ‘70s. • Future Leaf assistant coach Mike Kitchen played with Gardner in Colorado. • Don Cherry of Hockey Night in Canada fame not only coached the “Big Bad Bruins” in the mid-to-late 1970s, but also the Rockies for a brief time after that. Besides Lanny McDonald, Cherry also coached one of his former Bruin favorites there—Bobby Schmautz. • Jack Valiquette, a one-time first-round draft choice of the Leafs as an 18 year-old, also played for Cherry in Colorado, after being traded by the Leafs. • Another Leaf first round draft choice, Bob Neely, played briefly in Colorado in the late 1970s (before Cherry was there). • Ex-Toronto (WHA) Toro “Leaping” Lou Nistico played with the Rockies. • Barry Beck, the second overall selection of the Rockies in 1977, never quite became the superstar defenseman scouts had projected, though he did have some solid seasons with the Rangers in the early 1980s. He played only briefly for Cherry. 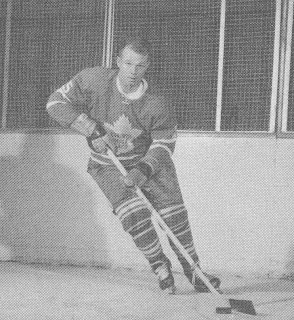 • Former Rockies coach Cherry played in the Leafs’ “system” in the 1960s (see photo). He played for Rochester between 1963-’64 and 1968-’69, along the way playing with former Leafs Eddie Litzenberger, Gerry Ehman and Al Arbour as well as future Leafs such as Mike Walton, Pete Stemkowski, Brian Conacher and Jim Pappin, each of whom won Cups with the Leafs. Don also played with ex-Leaf goalie Gerry Cheevers, who he later coached in Boston. • I can’t recall the exact quote, but before Lou Lamoriello came on board and turned the New Jersey franchise around, Wayne Gretzky once referred to the Devils as a “Mickey Mouse” (or words to that effect!) organization—an unusually frank remark from a player who made a career out of saying nothing that could be construed as controversial. • Young Leaf fans will remember Alex Mogilny as a highly-skilled if injury-plagued Leaf late in his career (remember his give way in overtime in Game 6 of the 2002 quarter-finals against Carolina? Series over…). He won his only career Cup with the Devils earlier. • Former Leaf winger Billy MacMillan (he played on a line with Dave Keon and Garry Monahan in the early ‘70s) once coached the Devils. • Mike Antonovich, who played with Keon in the WHA, played under McMillan with the Devils. • Joe Cirella is one of the few OHL players ever to be drafted by an NHL team (New Jersey, very early ‘80s), play a full season as an 18 year-old then be returned to his OHL team to play as a 19 year-old. • Chico Resch, who gave up Lanny McDonald’s OT goal in the 1978 playoffs against the Islanders, also played at the end of his career with the Devils. • I mostly remember Pat Verbeek as a really solid winger for the Hartford Whalers, but he played for New Jersey, too. • Future Hall-of-Famer Brendan Shanahan, recently retired, started his career as a first-round draft choice of the Devils in the late ‘80s. • Long-time Capitals General Manager George McPhee played for the Devils in the late ‘80s. • Leaf fans remember that Toronto traded their first round choice in the 1991 draft (only turned out to be Scott Niedermayer, oh well…) when they acquired New Jersey defenseman Tom Kurvers in the fall of 1989. Must have seemed like a good idea at the time. • The great Russian defenseman Fetisov, originally drafted by Montreal, started his NHL career with the Devils, before joining the Red Wings, where he won a Cup. He later was an assistant coach in New Jersey. • Claude Lemieux, one of the most annoying players I can remember (and a very effective one, too) helped the Devils, the Avalanche and Habs win Cups. Of the above, the Leafs sure could use guys like Verbeek, Lemieux, Schmautz, and, oh yeah, Niedermayer. The Leafs are due tonight. We’ll see.